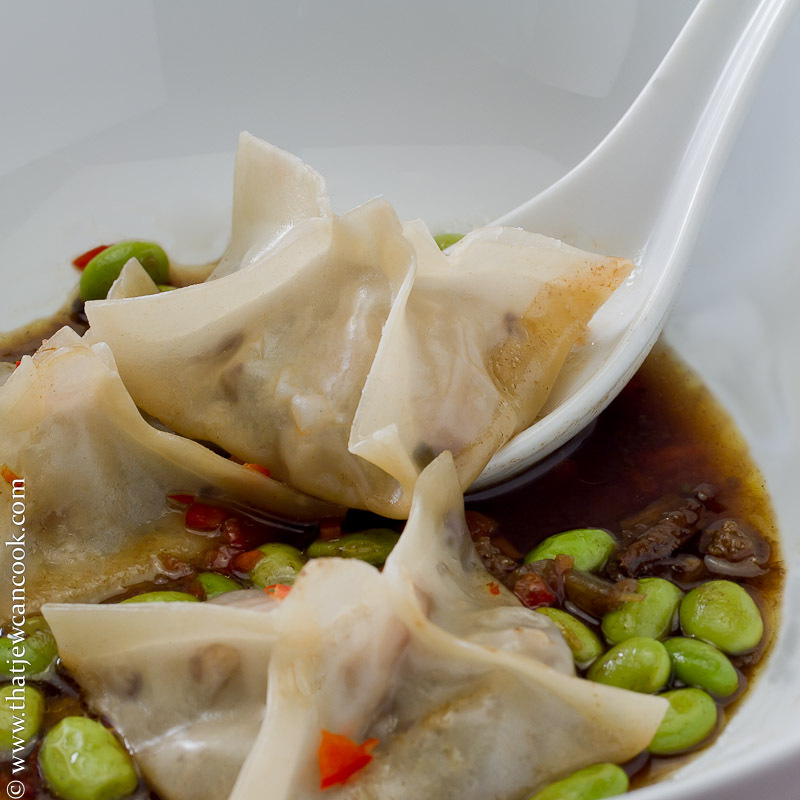 My buddy Frank and I have been going back and forth over a filet mignon starter course served by two local restaurants: his favorite is a ravioli in brown butter sauce, mine is a wonton served in a ginger miso broth. We knew we could out-do both of ’em and spur of the moment we came up with these amazing umami-bombs. We both liked it better than our faves and the crowd we served it to went wild; but there were places for improvement for version 2.0. Before we get started, let me talk about what I didn’t like about our dish: the sauce looked muddy, we should have defatted it and strained it through a chinois. I also wanted a few chives or tiny bits of scallion floating, but I didn’t have any on hand. Finally, there are probably too many ingredients. We just kept adding stuff to the broth until it tasted right. We can likely simplify this down a bit. OK, enough of the disclaimers, what is in it? 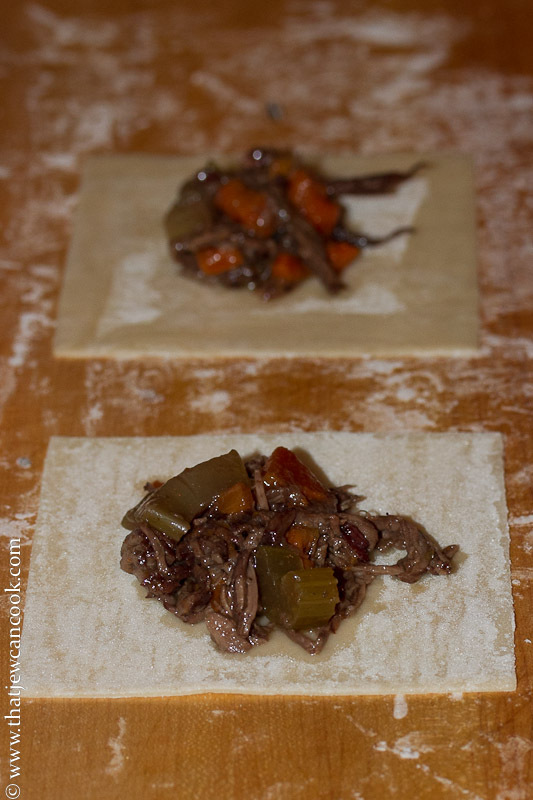 The filling has its roots in the braised short rib recipe, except we used filet mignon and skirt steak. Each package had a small spoonful of shredded meat, and some of the braising veggies. The broth started with the remaining braising liquid with a mess of crap added: miso paste, beef broth, rice wine vinegar, mirin, grated ginger, sriracha, reconstituted porcini mushrooms (with strained liquid), some edamame and red pepper garnish. Whew, that was a bunch of stuff. So, why did we decide on wontons instead of ravioli? That’s easy, I was being lazy. I naively thought that pre-made wonton skins would be less work that making the pasta dough, rolling it out and stuffing it. The pasta method would have been easier because I can make a whole sheet of ravs in one go (rustic style) while wontons were painstaking to make look all purty. 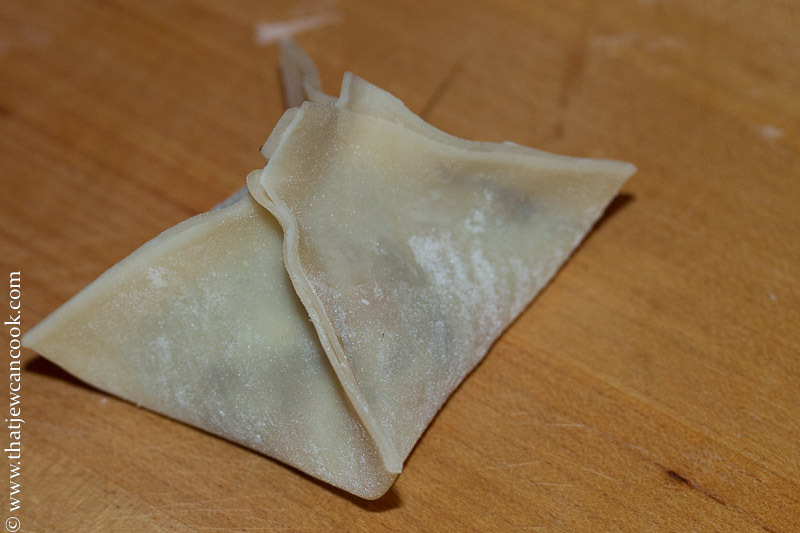 Frank would have no part of making sloppy looking wontons. In the end though, the flavor profile was much more Asian than Italian, so the wontons were probably a better call anyway. In a large dutch oven, render the fat from the pancetta and remove the bits until later. Cut the meat into manageable hunks, dredge in flour and sear until all sides are brown. Remove the meat, add a little oil and saute the veggies until translucent, and add everything back to the pot. Simmer on low for several hours until the meat is able to be shredded with a fork. To cook, I just place some lettuce leaves on the bottom of a steamer basket and layer in the wontons. You need to do it a batch at a time or use one of those stacking steamer baskets. We have a cheapy bamboo steamer stack which failed on us during this meal, so you may want something more durable. I generally cook them until the skins get a little translucent and then a few minutes more. Mix in everything in a small saucepan and simmer for a bit. You don’t want to reduce it much, it’s not supposed to be a gravy. Probably this is where you should defat and strain (if you look at the last pic on this post you can see that the edge of the liquid in the bowl looks pretty messy). Also be careful with these measurements, we kinda winged this part, so consider this a guide and keep tasting and adjusting until you are happy. Me, I’m always happy, just don’t burn my food (a story for another day kids). Warm up the edamame in the microwave for 30 seconds. 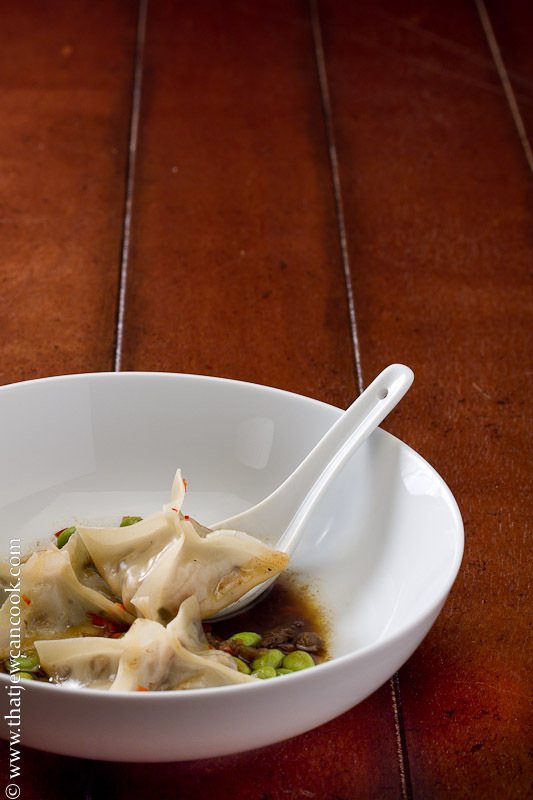 Plate 3 or 4 wontons, a scoop of broth, some edamame in a bowl and a sprinkle a little of the red pepper for garnish. Slurp away my friends, slurp away. These look and sound excellent. I’m intrigued with the components, even if you suggest you might have had too many. At any rate, it sounds like you and buddy Frank had a blast in the kitchen concocting them! Thanks Eggy, these were indeed awesome. I think we had 10 each! Nicole and her friends were really happy with our crazy experiment! Standing ovation. Gorgeous photos and incredible innovation and recipe development. YOu are so fortunate to have friends that like to do this kind of thing with you. I don’t. I have developed many like minded friends within our local food community, but none that I could do a smack down like this with – without it becoming a major production just to get organized. What do you have to do to get invited to one of your smackdowns, anyway? I know I live a long way off… but with a “Umami bombs” like this at the table, I would crawl all of the way! You and Vanja are always invited, if/when you are planning to be in the NY metro area you should give us a call — I am sure the food and drink will be flowing! This was an amazing dish and I am so happy that I was at the dinner table. Mr. Jew and Frank always outdo themselves and I am lucky I can be apart of their creativity. This dish is over the top! Absolutely beautiful. You can see and feel the flavors in this dish. What a fun and tasty experiment! Love it, plus it looks very elegant. Andy, I’m lovin’ this. Also your sentence “The broth started with the remaining braising liquid with a mess of crap added” haha! Your broth sounds divine, I love miso and porcini, so I’m sure it tasted rich. Do you think just the skirt steak alone would taste ok? Be much cheaper, that’s for sure. I am like Canadian Foodie and don’t have many foodie friends to cook and experiment with. All my fave foodie friends are in Sydney. Everyone here expects me to do all the cooking and is threatened by me, which is silly because I’m not competitive, just happy to not have to cook all the time. Well done, I bet the next batch will be even better! You can absolutely use just skirt steak and it will be magnificent. I had planned on just using the filet, but when more people arrived I needed more than I had on hand. The skirt is a much meatier taste, and in my mind better for this. so pumped I just stumbled across this recipe! Making it tonight for a cast iron cooking competition. Quick question…you cook the pancetta and use the fat to sear the meat, but do you dice and throw in the pancetta somewhere? In the wonton maybe? Yes, I throw some of the pancetta in with the shredded meat and veggies. Good luck with the competition and let me know how it goes!